Both functionality and portability make this unit and affordable item for any work or instructional environment. With construction by respected Berkeley, a leading name in office and educational products, this unit is made for years of reliable use. The design with the baked enamel steel black base and cherrywood top provides an attractive and durable addition to any environment, from home office to school to the worksite. 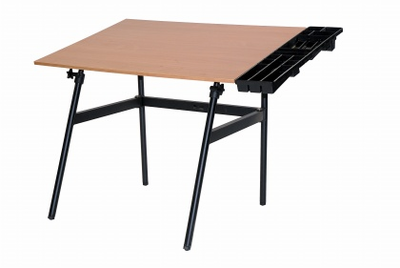 This item uses the classic Berkeley folding table and offers a work surface of 30” by 42” with a convenient side tray for tools and supplies. The pricing and durability make this table a perfect choice for use in both the work and classroom environment. The easy folding base allow for storage until needed and quick setup onsite. Note: Shipped flat pack to save on shipping and assembly with simple tools is required. Oversize shipping cost of $55.00.